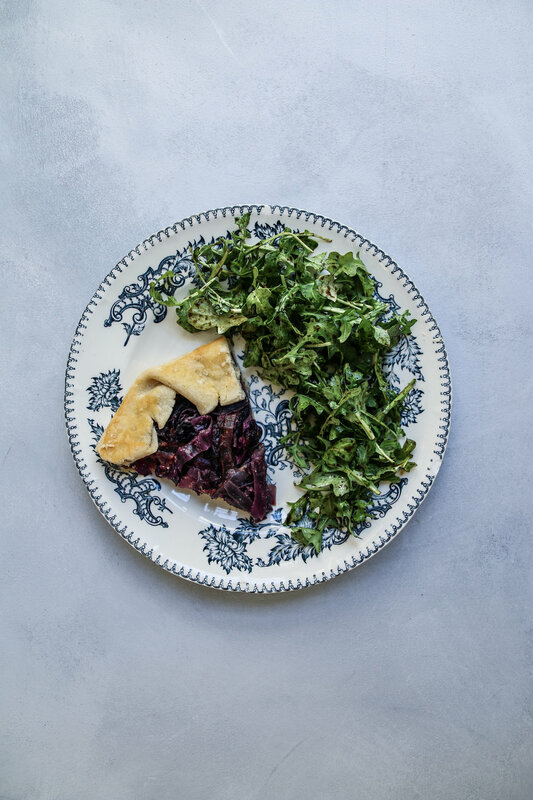 A savory pastry made of flakey, buttery crust and filled with vibrant purple-red onions and cabbage is a lovely addition to any lunch or dinner table this June. The caramelized flavor of the vegetables in this galette make it deliciously rich and flavorful, with the help of crème fraîche and parmesan. I prefer to bake my galettes on parchment, as it helps keep the pastry from sticking. My favorite cast iron pan (see here) goes to good use helping toast that buttery crust, studded with large flakes of sea salt. If you haven't made a galette - sometimes called a 'free form tart' - before, don't let homemade pastry intimidate you! When shaping the dough and folding over the edges, there's no need to fret if the galette doesn't end up completely circular or if some edges are a little torn or misshapen. The more rustic it looks, the better. The filling is just scrumptious, it truly is. If you like caramelized onions, you're in for a lovely little treat. Be sure to use both red onions and red cabbage to achieve a cohesive deep purple-red hue. 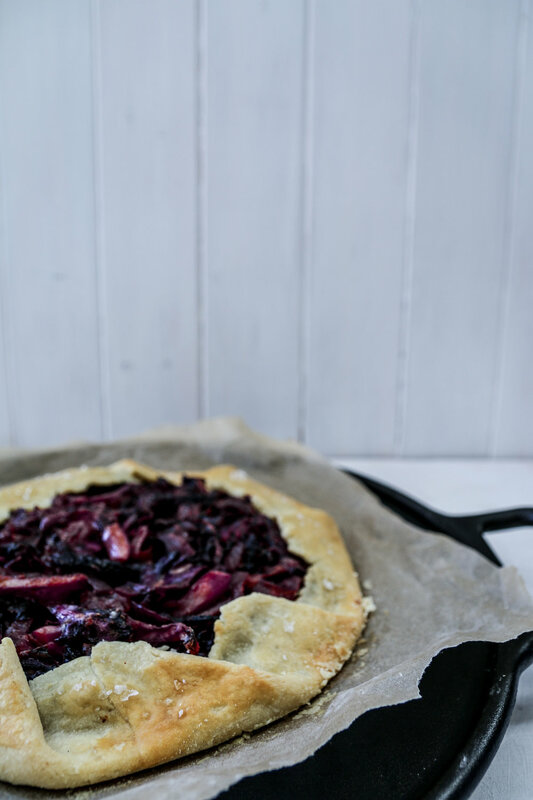 This galette is great hot out of the oven, at room temperature, and even cold, eaten straight out of the refrigerator the next day. You can experiment with toppings; parsley, a dollop of crème fraîche, shaved parmesan or a drizzle of balsamic vinegar would all be just wonderful. I think this is best had with a simple salad of arugula tossed with balsamic vinegar and olive oil as well as a generous glass of chilled rosé. Cheers! *Any good pie crust recipe will do, go ahead and use your favorite recipe if you'd like - this is my own favorite pie crust recipe! Mix the flour, sugar, and salt in a food processor, pulsing until combined. Add the butter, pulsing just until there are small bits of butter throughout, resembling sand. Add the water, a tablespoon at a time, until the dough just begins to come together. Wrap in plastic wrap and tuck away in the fridge while you make the filling. *Alternatively, you can use your favorite pie crust recipe here. Cook the onion in a large skillet with a few tablespoons of olive oil over medium heat, until translucent. Add the cabbage along with 2 tablespoons of butter, and cook until the onions and cabbage are very soft and browning slightly. Add the balsamic vinegar at the very end, stirring until fully incorporated into the cabbage and onion mixture. Transfer the cooked cabbage and onion to a large mixing bowl. Add the parmesan, crème fraîche, and salt and pepper to taste. Take the dough from the fridge and roll out on a floured countertop or a large piece of parchment paper, rolling until it's about 12 inches around. Transfer to a baking sheet lined with parchment, prick a few times with a fork, then spoon the filling into the center of the dough, leaving at least two inches around the edges. Fold the dough edges over, working clockwise and pressing them together. Combine the beaten egg and tablespoon of milk, then brush dough with the egg mixture, sprinkle the edges with sea salt and pop it into the hot oven. Bake for 45 to 50 minutes. Serve with salad and some rosé, if you so please.